6 + 12 = 18? Check it out! 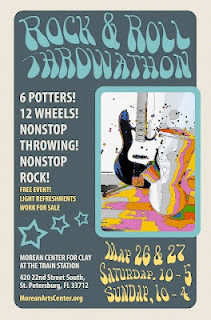 This weekend I'll be one of six potters -- that's the 6 -- throwing on two wheels -- 6 x 2 = 12, so that's the 12 -- each at the Rock & Roll Throw-a-thon at the Morean Center for Clay at the Train Station aka St. Petersburg Clay Company. My guess is I'll whip out 40 or 50 bowls, pots, and jars easy. In one day. Times 6 x 2 days ... we just might produce 600 or more objects this weekend! Does Guinness have a spot for us? 420 22nd Street S. in St. Petersburg. Look for us in the back section of the old train station. I'm told the music will be crankin' ... and so will we! Come cheer us on.